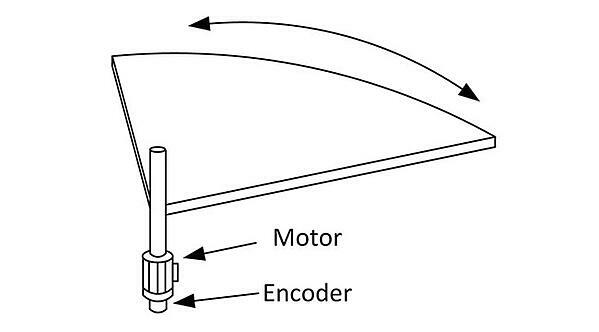 To measure the angular displacement of the load directly, the encoder should be mounted on the center pivot point of the load. As the load turns, the encoder relays the signal to the receiving device. This data only consists of either displacement pulses (incremental encoder) or initial and final absolute positions (absolute encoder). The reading device, whether it is a drive, a controller, or some type of counter/display device, needs to process the raw data into useful information. where C equals counts and CPR equals counts per revolution. It is also possible to measure the angular displacement of a load by monitoring the motor shaft or an Idler wheel. In this case, we get best results by turning the motor shaft a set number of times and correlating it to the displacement of the load to come up with a conversion factor. This is the traditional use case for a rotary encoder. It has the benefit of improving motor performance through direct feedback. The drawback is that it may not accurately track the movement of the load. Mechanical compliance introduced by couplings, gearboxes, etc. can introduce errors like backlash and hysteresis. The conversion factor theoretically takes this into account, but mechanical effects can drift over time. Some loads are incompatible with center-pivot encoder mounting. Satellite dishes, for example, need to be rotated to point in the direction of the signal of interest to a high degree of control. Both the mechanical design and the presence of electrical cabling passing up through the central shaft make it impossible to install an encoder at the pivot point to monitor position directly. Depending on the degree of control, an extremely high-resolution encoder may also be required. The solution is to track these devices along their circumference. where RB is the number of counts on the band and N is the reduction ratio of the gearbox on the multi-turn encoder. The contact may consist of a toothed gear wheel engaging with a toothed band on the load. 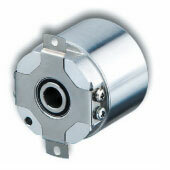 Alternatively, it could be a friction contact from an encoder measuring wheel or even a belt. Error sources include mechanical couplings, backlash from the gearbox, shaft runout and de-centering, belt slippage in the case of friction contacts, and others. The high reduction ratio of the gearbox minimizes the effect of mechanical error. The exception to this is friction in the gearing and seals of the gearbox. In this case, the impact of friction is multiplied by the number of turns. Incremental angle encoders can only register displacement from some arbitrarily defined home position that is established at startup. This home position, usually referred to as an index, creates only one pulse throughout one complete rotation of the code disc. This enables the device processing the encoder signal to track the number of full turns of the encoder disc from the home position. However, the index pulse is not unique so the number of full rotations counted is often lost if the device is powered down and it must be rehomed on startup. 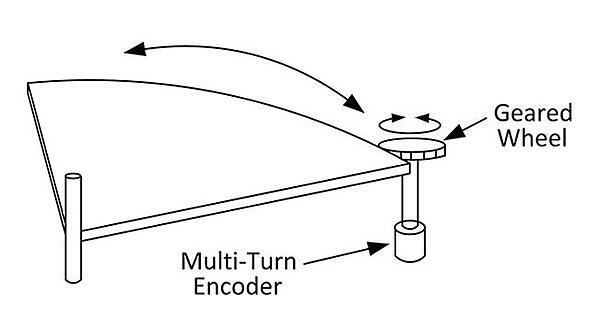 An absolute angle encoder outputs a unique digital word for each position of the code disc. 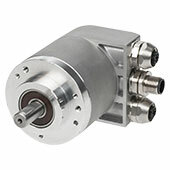 Multi-turn absolute angle encoders also track the total number of full revolutions with a digital word. Thus, there is no need for homing and the information is not lost when the device is powered down. The moment an absolute angle encoder is turned on, it can report exactly where it is by reading the digital word of that particular angle. Interpolating the signal of a quadrature angle encoder can also deliver a significant performance boost, depending on the implementation. If the processor of the receiving device treats the leading edge and trailing edge of both the A pulse and the B pulse as individual pulses, it quadruples the effective resolution of the angle encoder. For example, this interpolation technique could enable an industry standard 1024 PPR quadrature encoder to resolve angles of just 0.088 degrees. However, it should be noted that any errors will be multiplied by along with the resolution. These can degrade performance, which means that an attempt to increase system accuracy by creating higher resolutions through interpolation might have the unintended result of amplifying an error and degrading system performance. This is an example of how higher resolution does not improve accuracy. 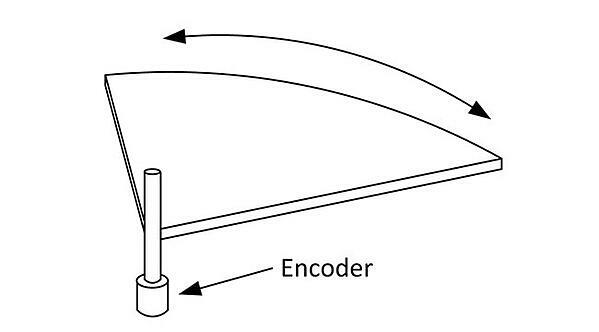 Learn more about encoder accuracy vs encoder resolution here. Quadrature angle encoders also allow the direction of that rotation to be monitored. In a quadrature encoder, the disc has two separate sets of markings (channels) that are offset so that the signal for the B channel is 90 degrees out of phase (in quadrature) with that of the A channel. This enables the receiving device to determine the direction of rotation. Customer Question: How can I measure angle to 0.1 degree? Answer: Assuming you are measuring the rotating shaft directly, start by determining the required resolution. If you want to measure to 0.1 degree, first, determine whether that number applies to resolution or accuracy. If resolution, you need an encoder with 10 pulses per degree. Multiplying that by 360 degrees, you get a required resolution of 3600 PPR. Thus, a 3600PPR angle encoder can be used. Alternatively, decoding the rising and falling edges of both A and B channels of a quadrature encoder, you can quadruple the resolution of a 900PPR angle encoder to achieve the same effective resolution, although any error will also be amplified. Unfortunately, this is only the theoretical accuracy. Evaluate any possible errors in the system, including alignment, mechanical linkages, play in the system, etc. If the system cannot physically position to 0.1 degree, you may need to lower your resolution specification. EtherCAT encoder interface, fast cycle times, 400G shock, 30G vibration rating, up to 32 bit combined resolution. Compact size 15 or 38mm diameter hollow shaft absolute encoder. SSI, BiSS, SSI Gray options. Up to 22 bit ST and 12 bit MT resolution. 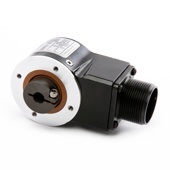 Compact 2.0" size incremental hollow-shaft encoder with electrically isolated shaft design. ABZ and differential output options. 1-2,540 PPR.